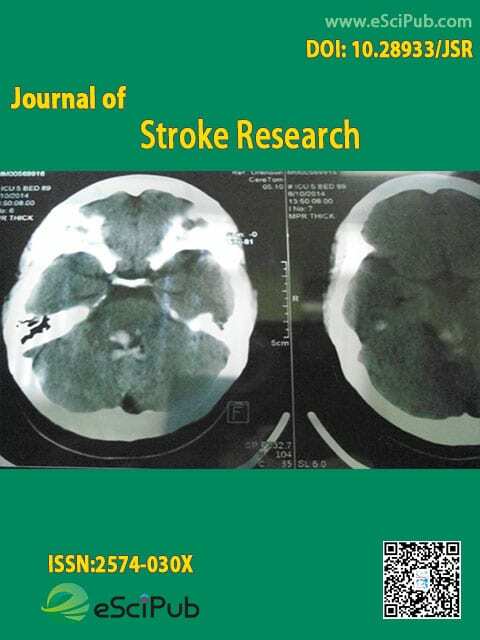 Journal of Stroke Research (ISSN:2574-030X; DOI:10.28933/JSR) is a peer reviewed open access journal publishing research manuscripts, review articles, case reports, editorials in Stroke. Resident Physician, Department of Neurosurgery, University of Virginia, Charlottesville, VA, USA. Head Department of Rehabilitaion, Bachcha Hospital, Katihar, Bihar, India. Associate Dean for Research & Professor, Byrdine F. Lewis School of Nursing and Health Professions, Georgia State University, Urban Life Building |8th Floor-Suite 819, 140 Decatur St. | Atlanta GA, 30303, USA. Professor and Chairman, Department of Neurology, Toho University Omori Medical Center, 6-11-1 Omorinishi Ota-ku Tokyo, JAPAN. Professor & Director, Institute of Clinical Neurobiology, Vienna, Austria. Professor & Associate Director, Center for Cerebrovascular Research, Dept. of Anesthesia, Box 1363, University of California, San Francisco, USA. Professor, Department of Psychiatry, Chinese University of Hong Kong,Hong Kong, China. Associate Professor, Stroke, Division of Clinical Neuroscience, Clinical Sciences Building, School of Medicine, The University of Nottingham, Hucknall Road, Nottingham NG5 1PB, United Kingdom. Associate Professor, Department of Pediatrics, Medical University of South Carolina, 508 CRI, 173 Ashley Ave, Charleston, SC, USA. Journal of Stroke Research is a peer reviewed open access journal publishing research manuscripts, review articles, case reports, editorials, letters to the editor in stroke (Indexing information). Submit your manuscript by the form below or send it to submit_manuscript@escipub.com (use "Journal of Stroke Research" as the email subject line).